There was something truly special about the first time I held a business card with my name on it. My first full-time job was working at a bank and within a couple weeks of working there, I was given a box full of business cards with my name in classy embossed lettering. Something about that little card made me feel like I was important, I was finally an adult, and I mattered. I wanted to give one of those little cards to every person I came in contact with. At that point, I didn't even have an email or phone line, but I had my name and my title. Of course, I changed my name the next day and that first box was no longer usable. Every step of publishing my first book has made me feel more and more like a 'real' author. Making my own business cards is a huge step. This is really happening. 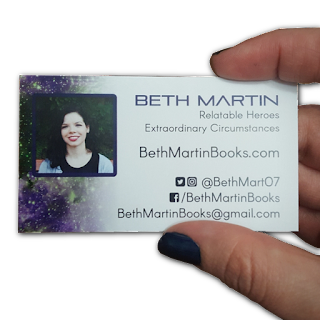 I write books, and every person I come in contact with will get my card. Well, at least the people who show some interest. The whole self-publishing journey has had a lot more steps than I expected. Everyone says that writing the book is the easy part, and finishing a book is not easy. Naturally, I'm proud of everything I've accomplished so far and can't wait until my first book is published and for sale. Until then, here, take my card.